Chamblee Lady Bulldogs bring home DeKalb’s first state swim title since 1987 and the program’s first ever title. 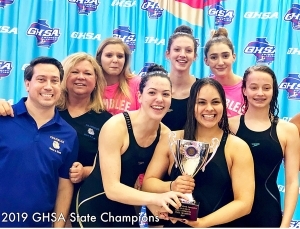 Three gold medals and two silver medals helped the Chamblee Lady Bulldogs collect 262 points to get past St. Pius X for the girls’ Class 4A-5A State Championship at the Georgia Tech McCauley Aquatic Center last weekend. The victory was the program’s first ever state swim title, DeKalb’s 18th girls’ swim championship and first DeKalb state swim title since 1987. The win also brings DeKalb County’s title count to 315 including all sports since 1938’s literary title and the first athletic title by Clarkston in boys’ basketball in 1940. Chamblee opened the meet by winning the 200-medley relay for the second time in three years with a time of 1:45.94 (new team record) produced by the team of Kyla Maloney, Jade Foelske, Teresa Maloney and Sophie Bell. Foelske and Teresa Maloney were both part of the gold medal win in 2017 as the Lady Bulldogs finished runner-up at state. Senior Jade Foelske was the catalyst for Chamblee swimming All-American times on the way to her fifth and sixth individual state gold medals. She won gold in the 100-yard butterfly for the fourth consecutive season with a time 53.81 and captured the gold for the second consecutive season in the 200-yard individual medley (2:00.22), both times were team records. 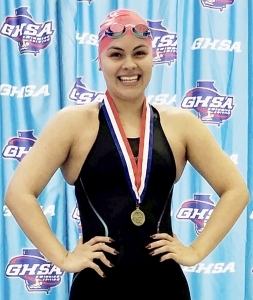 Chamblee’s Jade Foelske became the Lady Bulldogs second swimmer to become a six-time state champion tying her with former Chamblee great Heidi Jachthuber (1974-76) for second most in DeKalb County history. Foelske’s six state gold medals ties her with former Chamblee great Heidi Jachthuber (1974-76) for the second most girls’ state medals. Four DeKalb girls’ swimmers are tied for the most with seven all from the 1960s and 1970s. Freshman Kyla Maloney set a team record in swimming to the silver medal in the 100-yard backstroke with a time of 55.91. Chamblee put the title away with a strong silver medal finish in the 400-yard freestyle relay with a time of 3:34.31 by Foelske, Anna Blankenship, Teresa Maloney and Kyla Maloney. Foelske got the team off to a quick start swimming a school record time 52.08 in the 100-yard first leg. Druid Hills finished 22nd overall in the girls’ meet with 31 points on the back of Anna Verlander with a sixth place finish in the 50-yard freestyle (24.80) and ninth in the 100-yard freestyle (54.08). The Lady Bulldogs under the direction of coaches Lorri Reynolds and Greg Valley had finished in the Top 10 at state four consecutive seasons entering this year’s state meet. Chamblee was fourth in 2015, fifth in 2016, runner-up in 2017 and eighth a year ago. Dunwoody won the last three titles on the girls’ side taking the crown in 1985, 1986 and 1987 to tie Lakeside for six state titles. Chamblee finished seventh overall in the boys’ standings for their 16th Top 10 finish and seventh consecutive dating back to 2013 as they put together 189 points. 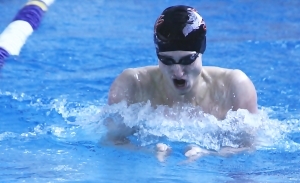 Louis Cardot had the top finish for the Bulldogs with a fourth in the 100-yard butterfly (52.31) and a seventh in the 500-yard freestyle (4:52.46). Theo Hardy and Tyler Trocchi also put up seventh place finishes in the finals. Hardy in the 50-yard freestyle (21.65) and Trocchi in the 200 individual medley (2:00.32). The 400-yard freestyle relay team of Will Decker, Trocchi, Cardot and Hardy added 38 points to the team total by taking fourth in the event (3:13.88). Druid Hills was propelled to an 11th place finish in the boys’ Class 4-5A by a pair of gold medal wins and state record performance from senior Liam Bell. Bell shattered the state record of 54.28 in the 100 breaststroke set in 2018 by Rome’s Mason Hunter by .45 of a second with his All-American time of 53.83. He also swam to an All-American time of 1:49.65 to take the gold in the 200-yard individual medley. Druid Hills finished fourth in the 200-yard medley relay (1:36.91) and sixth in the 200-yard freestyle relay (1:28.94) as Bell teamed up with Idris Muhammad, Javin Carey and Zachary Bauer in both events.